My name is Carlo DeVito, and I am the author of East Coast Wineries: A Complete Guide from Maine to Virginia published by Rutgers University Press. This blog is dedicated to primarily east coast wines and wineries including Maine, New Hampshire, Vermont, Massachusetts, Rhode Island, Connecticut, New York, New Jersey, Pennsylvania, Delaware, Maryland, Virginia and West Virginia. It will also feature products and information from other regions. Coyote Moon is a family affair. Like many in the industry, Phil Randazzo, owner and winemaker, was inspired to open Coyote Moon vineyards after a family trip to wine country - in specific, in this case, Italy. Phil and his wife, Mary, took their daughter, Kristina, to Sicily as a graduation gift. It turned out that their visit to Sicily did the trick. By 2008 the Randazzo family planted their first vineyard and began selling Coyote Moon wine in 2009. Soon after opening, Phil's son and daughter-in-law, Tony and Lori moved across the country to join the Coyote Moon family along with Kristina's husband, Christian Ives. I was at a wine tasting last year, and I tried two grapes I had real interest in - Frontenanc Blanc and LaCrescent. The original 'Frontenac' was introduced by the University of Minnesota in 1996, by the University of Minnesota as the prototype cold climate grape. They also introduced Frontenac Gris. However, more recently, several growers in Minnesota and Canada have independently discovered white-fruited mutations of Frontenac and Frontenac gris that have now come to be known as 'Frontenac blanc'. These Frontenac blanc lines lack pigment and make white wine. This is an exciting new development for cold climate growers. Frontenac has proven to be an outstanding vine and Frontenac gris shows exactly the same vine growth and disease resistance traits. The University of Minnesota released Frontenac blanc in 2012. When I first saw the bottle of Coyote Moon Frontenac Blanc, I did a double take. I hadn't seen a varietal wine from this grape yet in New York or anywhere. I had to try it! This wine starts off smelling like a fresh cut fruit salad with white plum, nectarines and apricot. It smells like it would be sweet. But the white wine here is lovely. Light, bright, and with a citrusy finish I was most, most impressed. A wonderful dry white wine!!! A rare treat! According to the University of Minnesota: "The La Crescent grape is a very cold hardy grape cultivar that produces a white wine of excellent quality, reminiscent of the cultivar Vignoles. Its relatively high sugar and acidity levels have encouraged winemakers to ferment La Crescent in a sweet or semi-sweet style. La Crescent wines commonly have aromas of apricot, peach, citrus and pineapple and lack strong herbaceous aromas or those associated with V. labrusca." Try to their word, this Coyote Moon Vineyard LaCrescent has a HUGE nose of apricot, peach, and pineapple. But the light white wine, which was completely dry, was exquisite, with a nice, citrusy tang to finish it off! I absolutely loved this wine!!! Phil Randazzo has done an excellent job of making classic dry white varietals from these grapes in the best sense of classic wine making. Terrific and surprising stuff!!!!! 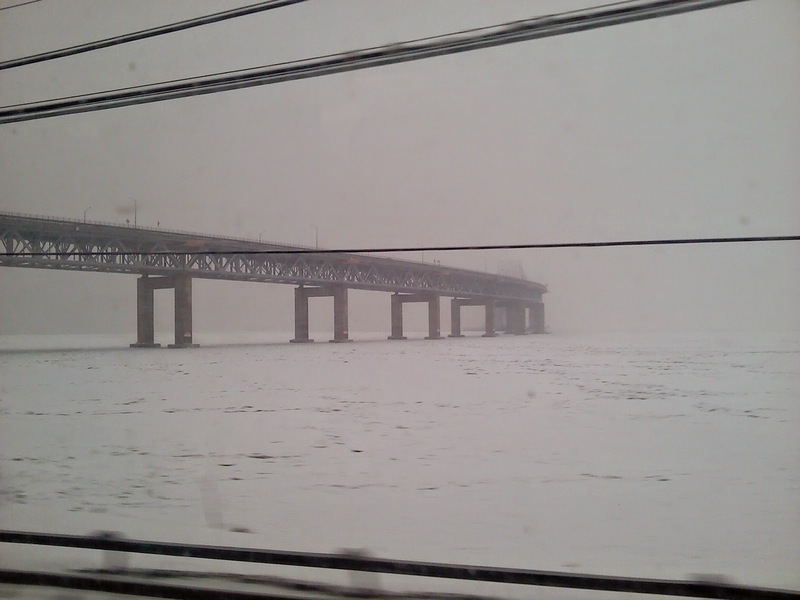 I had left the wilds of the Hudson Valley in the coldest and snowiest of mid-winters. Santa Barbara beckoned light a shining beacon of warmth and smiles and happiness. 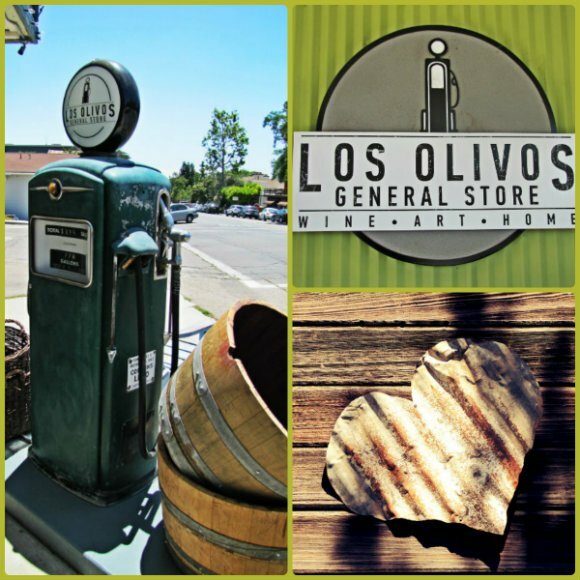 One of the places I went was Los Olivos. If the Lampock Wine Ghetto is the cool, hispster, east village of California wine, Los Olivos is the Disney World of California cool climate wine. At one time, Los Olivos was a small little town in the foothills that all trickled down from the Santa Barbara, St. Ynez, and St. Rita Hills. It consisted of a gas station or two, a deli, a liquor store, and four or five dozen homes and some small, assorted shops. Some time ago, all that was left was the gas tation/deli nd the liquor store. Seemed everyone needed the gas station, and the liquor store was the only one around for miles. The best thing about the liquor store was that they carried all the wineries in those hills down in one location. It became the go to one stop shop for wine in the region. It and the gas station were the only thriving businesses. In the meantime, many of the homes and store were condemned, and it would seem Los Olivos was about to be erased from the earth. But then a funny thin happened on the way to oblivion. One by one, the houses that had been condemned were being bought up. And slowly, the little matchstick buildings were either being renovated or raised and replaced by new construction. And like a pheonix form the ashes rose this brave new world.....each house or old shop was now a tasting room for the many wineries in the region. The biggest prblem in the region, like the Hudson Valley on the east coast, was that it was too spread out. Los Olivos changes that. Almost every winery has a tasting room in Los Olivos or has bottles that can be found in any one of the stores and ships within a six to eight block radius. Wine aficionados park their cars, the en fun begins. They stroll the sidewalks and choose from more than 30 or 40 tastingrooms, as well as small boutiques, resstaurants and cafes. And yes,, he gas station is still there as well as the deli and the liquor store. One of the great day visits in all of wine tourism! There were too many to stop in on myshort visit, but here's what I did. I arrived early and get a sandwich and a coke and fortified myself early. And then visited only a dozen shops, though I would have liked to have stayed much longer. But fortified, I was ready to go tasting! Daniel Gehrs has a simple winemaking philosophy: “The holy grail of my winemaking is the taste of the grape on the day of harvest...The first duty of a wine is to be interesting. Life is too short for boring wines”. Closely following this dictum is a second, simply put “A wine must taste good. Not just for ‘tasting’ but for ‘drinking’!” Dan entered the California wine business in 1974 having just graduated from college the year before. He worked for Paul Masson Vineyards in Saratoga, CA before Dan, his wife Robin and Victor Erickson founded Congress Springs Vineyards on Erickson’s property in the Santa Cruz Mountains in 1976. In 1980 Dan’s Congress Spring’s 1978 Pinot Noir was awarded Wine Spectator’s “Spectator Selection” honors. This was followed up with the ’85 Chardonnay in which, in 1986, became the most awarded wine in California, surpassing all other varietals, according to the annual California Grapevine survey. The wines are excellent, and the ports are sensational!!!!! The Daniel Gehrs Zinfandel Santa Ynez Valley Limited 2006 was big, deep wine with lots of dark plum, cassis, and dark black cherry, with eath, and mocha and vanilla. Big and powerful and lovely. Beautiful and powerful wine! 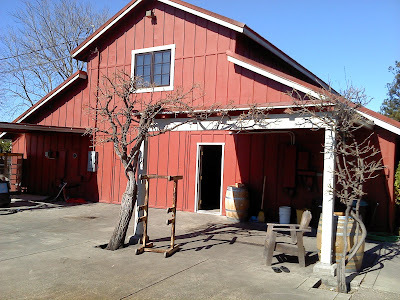 Longoria Wines is an artisanal family winery established in 1982 by Rick and Diana Longoria. Rick’s goal was to make outstanding Chardonnay and Pinot Noir, Rick sensed that those two varietals were poised to become the signature varietals for the new Santa Barbara County wine region. By 1982 he, with financial help from his father, produced his first 500 cases of Chardonnay and Pinot Noir from Santa Maria Valley vineyards. The rest was history. His wines are spectacular! 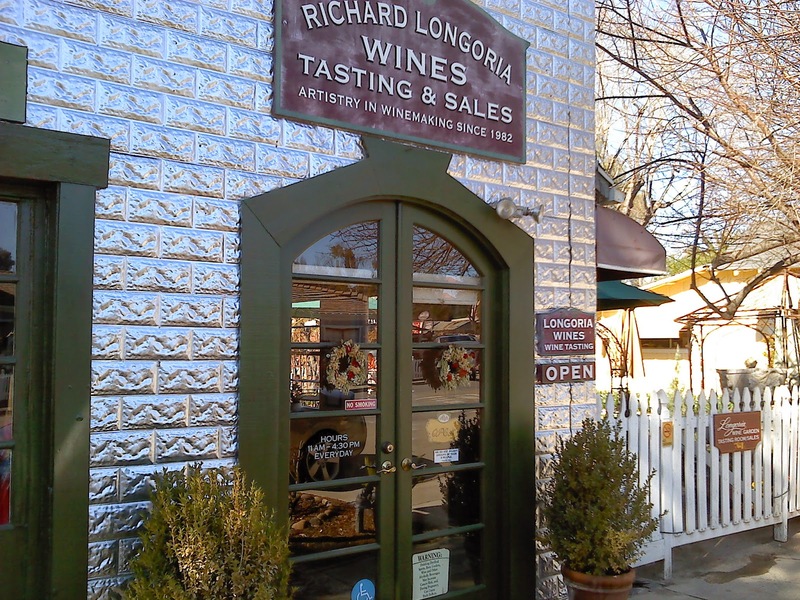 Rick continued to produce very small quantities of Longoria wines after he became the winemaker for The Gainey Vineyard in 1985. 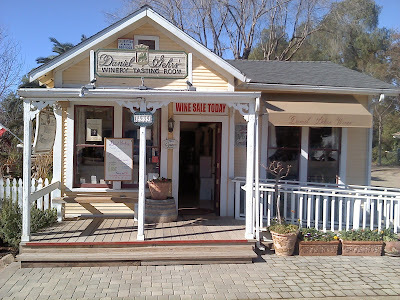 In May 1998, Rick and Diana opened the doors to their own tasting room in downtown Los Olivos and made their wines at the “Lompoc Wine Ghetto”. 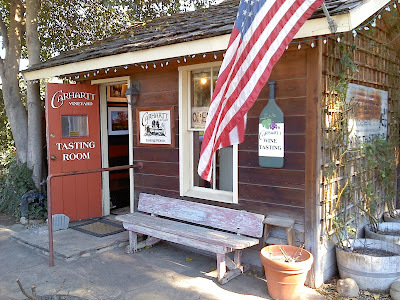 His was the first winery to be established in Lompoc. 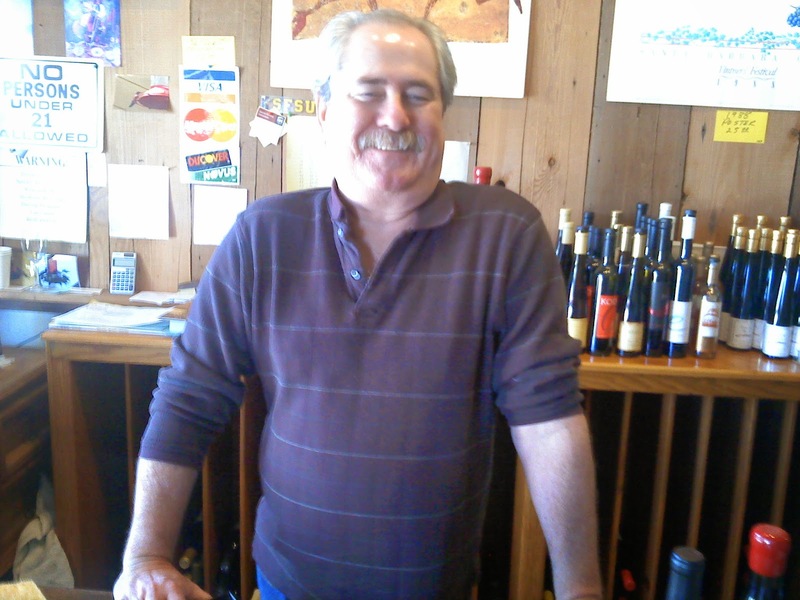 In 2014, Rick moved into a brand new winery on the site of Lompoc's historic JM Club, with the Longoria Winery Tasting Room located in the former club house. Rick states "From the very beginning of my career I felt that the Santa Barbara wine region had the potential to produce world class wines and it's been very gratifying to see that belief realized over the more than 30 years I've been here. It's also been very rewarding to have had the good fortune over the years to have some of my wines contribute to the acclaim of our wine region." Longoria wines are handcrafted in very small quantities ranging from 50 to 700 cases. Total annual production currently averages 3,000 cases. My two favorite wines of his were two Pinot Noirs. Absolutely outstanding!!!! Fe Ciega is the Longoria's only estate vineyard, planted by Rick in 1998 and expanded to a total of 10 acres in 2008. The grapes were entirely de-stemmed and crushed into small open-top fermenters. The cold soak period averaged two days. After an eleven-day fermentation, the wine was pressed off, settled and transferred to French oak barrels for aging. Only 38% of the barrels were new, in an effort to balance the oak component with the fruit of the wine. After 14 months of barrel aging the various lots were blended, lightly fined, filtered and bottled. Big cherry and red currants with a hint of violets, vanilla, and orange zest. Exceptional! The Langoria Pinot Noir Santa Rita Hills Sanford & Benedict 2013 came from the famed Sanford & Benedict Vineyard. These are some of the most famous Pinot Noir vineyards n the west coast. Most of the grapes came from the Dijon 777 clone. The grapes were 100% destemmed and crushed into a small open-top fermenter. After fermentation the wine was pressed off, settled in a tank, then transferred to French oak barrels for aging. Only 39% of the wine aged in new French oak. After 15 months of aging, the wine was not fined but was lightly filtered before being bottled. Ripe ared cherries, hints of black cherry and cranberry are balanced by spicy wood notes as well as vanilla and caramel. A nice juicy ending. A delicious, mouthwatering Pinot Noir. A classic! Fantastic!!! 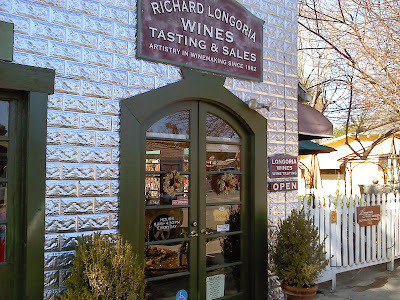 SPECIAL NOTE: LONGORIA welcomes visitors daily, but are now ONLY open at their winery tasting room at 415 E. Chestnut Ave. in mid-town Lompoc!!!! FYI!!! 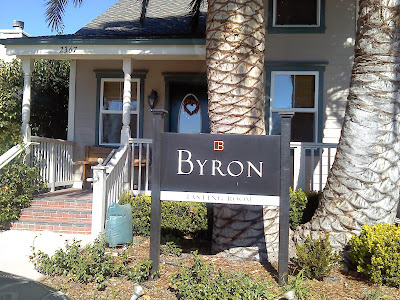 The Byron tasting room is among one of the nicest in Los Olivos that I saw. Very, very polished. Extremey nice. Super nice tasting room staff! Very professional. The Byron Pinot Noir Santa Maria Valley 2008 was a flavor bomb. A beautiful clear garnet red with flavors of bright cherry, raspberry, and hints of blueberry and cassis and violets on the nose, with a lovely touch of vanilla. A nice peppery finish. A charming and lovely wine. 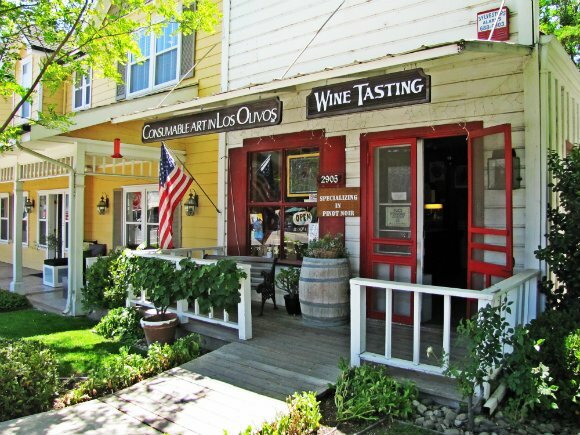 The Los Olivos Tasting Room & Wine Shop was established in 1987 as California's first independent tasting room specializing in Santa Barbara and Central Coast Pinot Noirs. They also carry fine handcrafted wines produced by the smaller, local winemakers and wineries that for the most part do not have their own tasting room or have limited days they are open. They feature such wines as: Alban, Ampelos, Au Bon Climat, Brewer-Clifton, Fiddlehead, ,Flying Goat, Herman Story, Jack Creek, Jaffurs, Ken Brown, Kenneth-Crawford, Lane Tanner, Lucia, Margerum, Ojai, Pacific Coast Vineyards, Stephen Ross. There are many other wines they carry. They offer wine tastings right there at the tastingroom/store. They also feature a very consumer friendly wine club. One of my instant favorites was Jaffurs Santa Barbara County Syrah 2009. OMG! Craig Jaffurs is the owner and winemaker, and has been making wine since 1989, and started Jaffurs in 1994. Dan Green joined Jaffurs winemaking team and partnered with Craig in 2016, and he and his family have joined the team. Of course, what else, Craig's first wine, the 1994 Santa Barbara County Syrah got rave reviews in Wine Spectator and Wine Advocate. The 2009 edition was a big, juicy, jammy Syrah filled with big red plum, love blackberry jam, and all kinds of exotic spices and flavors. Again it's a cool climate wine, much more in keeping with the French style. But all of the fruit, none of the barnyard. A brilliant and lovely Syrah! Peter and Rebecca Work purchased 82 acres in 1999 in the Sta. Rita Hills appellation, and named it “Ampelos,” the Greek word for vine. According to the website: "Soil. Vines. Wines. This is the order in which great wine is made. Waking up from the dream is the belief that a farmer must know his fruit, and we are resolute in our passion to produce hands-on, minimally invasive wines that both whisper and shout about the terroir from which they are grown. Our vineyard is one of the first in the US to be certified Sustainability in Practice, Organic and Biodynamic. Our commitment to eco-friendly, organic farming and wine making is evident in every sip." A cancelled meeting at the World Trade Center on the morning of September, 11, 2001, brought us to the realization that it was time to pursue our dreams of growing grapes. "We quit our corporate jobs and moved permanently to our fledgling vineyard...." They learned how to make wine from their son, Don Schroeder, now winemaker at Sea Smoke Cellars. Ampelos Vineyards now produces approximately 5,000 cases per year, with a focus on growing organic grapes and creating well-crafted wines. Ampelos Vineyards Santa Rita Hills Lambda Pinot Noir 2007 was impeccable! This wine is a collection of the six clones they farm there at the estate vineyard. Generally the wines are aged approximately 2 years. This was a breathtaking Pinot Noir with lovely cherry, cherry, cherry, and hints of violets and vanilla. Incredibly delicate and pretty! My last and favorite new find from Los Olivos was one of my favorite wineries in the entire region - Carhartt Winery and Vineyard!!! Mike and Brooke were born in Pasadena, but Mike essentially moved up to Rancho Santa Ynez full time in the early 1960’s, several years after his father purchased what was then a 2500-acre property. Mike and Brooke got married in 1982, and moved to the ranch with son Chase in 1993. I loved their tastingroom/shack It was a large converted shed, with a set of two lovely courtyards outside. You tasted at the bar, and then they also served you at one of the many small tables in the courtyard. Wonderfully relaxed setting. Fantastic. 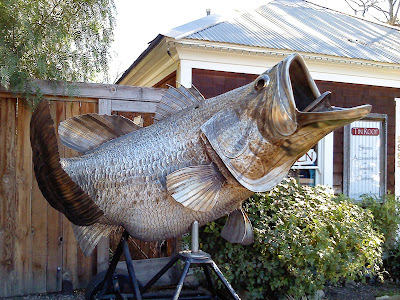 And they also had this amazing sculpture outside their place! 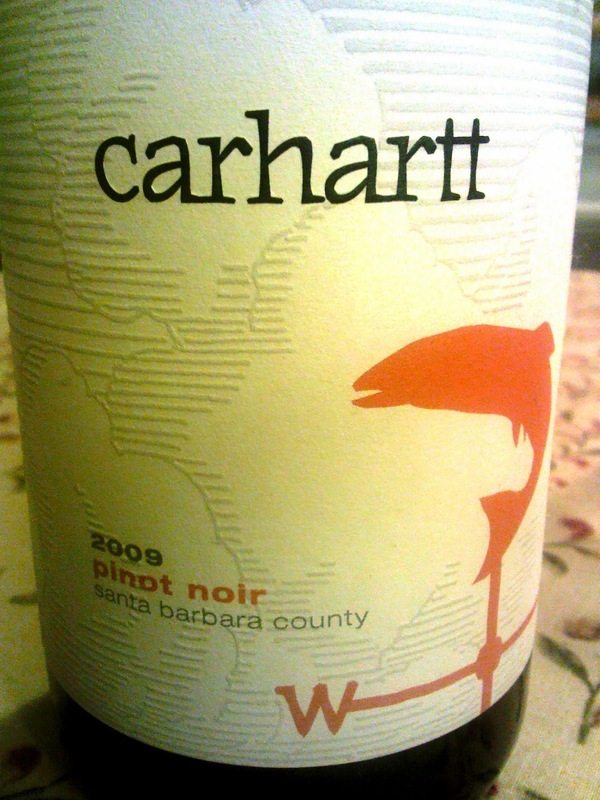 In 1996, the Carhartts planted seven acres of Merlot, and three acres of Syrah. At some point, they realized that selling 10 acres worth of fruit was not going to cover the cost of farming. In 1998, they made a barrel of Merlot and a barrel of Syrah. Since 1998, Carhartt Vineyard and Winery has increased its size to an average of 5,000 cases per year. When I arrived, I met Mike in the tasting room. What an incredibly affable and great guy. And he's a wine geek. He'll talk wine and grapes and wine...all day!! !And we did! Terrific guy, but even better wines!I loved everything I tried. Carhartt Fourplay Central Coast 2008 was spectacular! It is a blend of primarily (say the 40% range?) estate Merlot from Carhartt vineyard, at least 30% is Cabernet Sauvignon from Grassini Vineyard, and 20% Cabernet Franc and 2% Petit Verdot from Curtis Vineyard...or thereabouts! Mike cold soaked the fruit in small lots and used pump overs to break up the cap. It was laid down for 22 months in half new oak and half old oak. It is unfined and unfiltered. Black cherry and black tea come racing across the nose with some plum and some red cassis. Notes of mocha and vanilla and lots of spice. A truly wonderful, wonderful wine! The Carhartt Pinot Noir Santa Barbara County 2009 was also a stunner. This is a 100% Pinot Noir wine that was blended from two different vineyards: River Bench Vineyard and Sierra Madre Vineyard. It is a blend of Martini/Pommard on it's own rootstock, with clones 459 and 667. It was cold soaked and fermented in small lots, basket pressed, and aged for 12 months in approximately 25% new oak, the rest being older, which is good in my eyes, as new oak can sometimes completely overpower a delicate Pinot Noir. They made approximately 200 cases. This was a delicate wine, with hints of bright young cherry, with a hint of plum and spice. Leather and violets and blueberries on the nose. It had tremendous acidity and lasted for a long, long, long time on the tongue. A gorgeous layered red. I was sorry I had to leave Carhartt at all. I was getting in the way, and I needed to crack on. Must return! 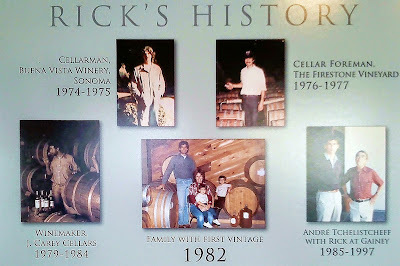 Just outside of town was Beckman Vineyards.It was founded in 1994 by Tom and Judy Beckman along with youngest son Steve Beckman. The wines from Beckman come from two vineyards: The 365 acre, certified Biodynamic Purisima Mountain Vineyard and the Winery Estate vineyard is 25 acres of rolling hills, situated in a wide valley just south of Los Olivos. 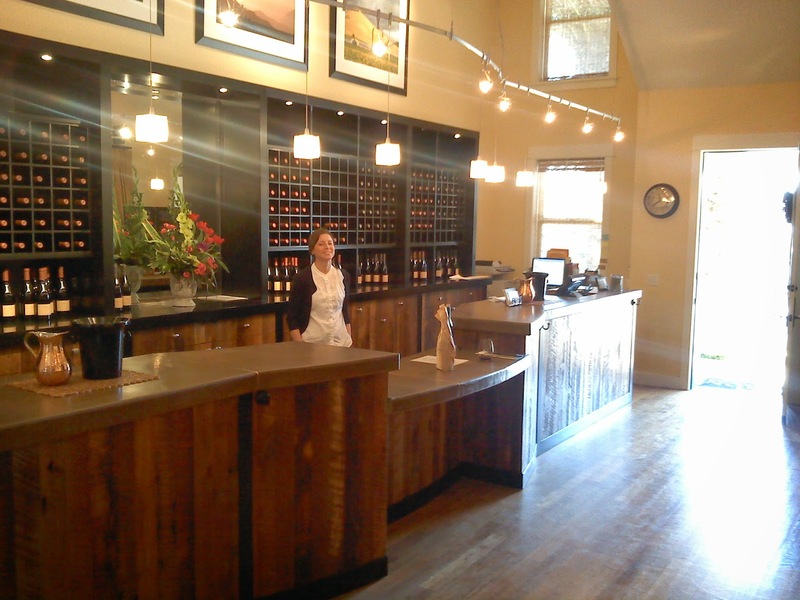 The tastingroom is big and airy and the wines are wonderful! Beckmen vineyards for a long time was considered a cult wine, hard to find, and delicious to drink. 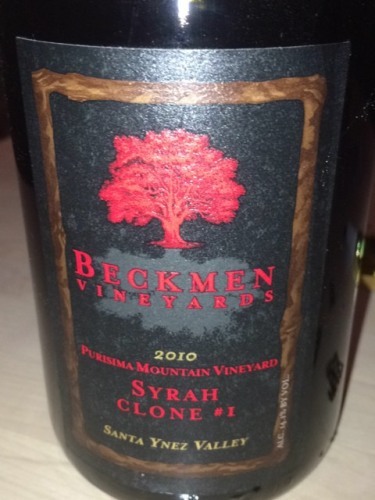 I fell in love immediately with the Beckmen Vineyards Purisma Mountain Vineyard Syrah Clone #1 2010. This is a big Syrah with backberry and cassis leading off an impressive nose that also had cherry, leather, and lots of toastiness and mocha. A big wine, the dark fruit up front folds into the mouth and lingers for a long time. This has a reputation as a Rock Star Syrah, and it is well deserved! 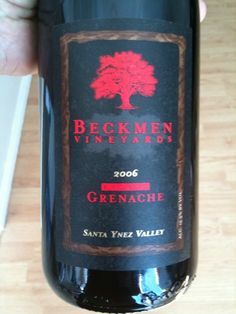 The Beckmen Vineyard Santa Ynez Valley Grenache 2006 was a siren. A medium-bodied red, with bright red fruit, couched in plum and pepper and spice, this delicate wine was so soft on the palate, so ethereal, I am not even sure how to write about it. I was only sorry I couldn't buy a case of it at the time. An incredible wine. Oh, by the way, did I say I LOVE Grenache? And the Beckmen Vineyards Estate Syrah 2007 was also most impressive. A big purple wine is the first thing that comes to mind. Blackberry and blueberry also come through along with mocha and lots of pepper. A big, fantastic wine that deserved a steak or a big grilled pork chop! I first had Smuggler's Notch at the Vermont Taste Camp 2016. I had tasted something of their's before, but this was the more complete tasting. Since then, they have been a distiller whose products I have actively sought out. Since then, I have had the opportunity to taste more of this fledgling distillery's new products, and I have been wholly impressed. Smugglers' Notch Distillery is owned by a father and son team, Ron and Jeremy Elliott. Ron, a retired business executive, and Jeremy, a research chemist in the pharmaceutical industry, inventoried their strengths, assessed various opportunities, and aligned their vision, which culminated in the decision to open a distillery. I am going to start first with their award-winning, premium single-barrel extra aged amber rum. According to the website, "Aged for 3 years in charred white oak barrels, the process is finished off with double-aging in 4 year-old whiskey barrels to infuse complex whiskey overtones. Each barrel offers a subtly distinct flavor profile...." Like the hold of all sail ships rumbling through humid and hot tropical waters, these rums were stored in unheated summer rick houses to provide that same warm climate feel, to make a more authentic aged rum. According to them, "Esterfication, a chemical reaction between an alcohol and an organic acid that is affected by time, temperature, and the components present, is an important process in developing the flavor profile of our rum. The lignin material of the oak barrels also contributes flavor components. Most of our rum color develops during the first year and steadily increases during the maturation process. Alternatively, rum esters form at a steady rate through maturation, melding the singular aromas and flavors unique to each barrel of rum." This amber colored aged rum is filled with sweet spice, caramel, honey, vanilla, and tofee. A most warm and glorious aged rum. Spectacular! Then I tasted, before release, several new products at the Taste Camp. The most remarkable of which was the Smuggler's Notch Straight Bourbon Whiskey. On a separate occasion I had the occasion to ample the Smuggler's Notch Litigation Wheat Whiskey. I had tasted the Smuggler's Notch Litigation Wheat Whiskey earlier. It was released on October 30, 2015, Litigation is handmade using a special blend of wheat and malted barley. It is matured in new Char #4 white oak barrels (like bourbon), at 92 proof barrel strength. Butterscotch, caramel, vanilla, all explode out of the glass, with hints of toast and spice. And incredibly balanced light but tasty whiskey. The Smuggler's Notch Straight Bourbon Whiskey is incredible. The spirit is a mix of at least 51% corn, balanced with rye, and malted barley. Smuggler's Notch uses barrels from several different manufactures to provide complexity and layers of flavor to their whiskies, aging them in their northern Vermont facility. They do lots of blending trials and blend with pure Vermont spring water. At 90 proof, this bourbon has a nose of sweet,boiled corn and rye with all it's nutty and spicy flavors. Caramel, toffee, breadpudding come across with white hard sauce, and spice. An incredible dram. Exceptional. Smuggler's Notch is incredible distilling!!!!!! I first started visiting Stonignton Vineyards back in the early 1990's. They were an outpost in wine making back in those days in the North Stonington area of Connecticut. They made Seaport White, a white blend and a host of other hybrids. Very nice, respectable wines. Always drinkable. The vineyards were established in 1987 by newly wed couple Nick Smith (a long time international banker) and his wife Happy, but a killer frost thwarted their endeavors. On July 4th, 1987, Mike McAndrew came on board as winemaker. The wines were nice, and drinkable. Always a pleasant stop. But better things were on the horizon. The winery proved to be a breeding grown of wonderful wine, and some serious wine was being made in the region. Around 2002 or 2003 the winery made one of it's best decisions when it hired Linda Mason as the vineyard manager. She reports to Mike, but her presence was felt, and better yet tasted, within two or three years time. It was a commitment Stonington needed to make to keep pace in the improving Connecticut wine world. And it paid off handsomely! In the last five or six years the Smiths updated the 29 year old tasting room, and upgraded their labels as well as make outstanding wine. Today he town of Stonington is one of the premiere winemaking regions in New England. It is the North Fork of the main land, across Long Island Sound from the Long Island wine country. And Mike McAndrews recent vintages are not only keeping pace with others, but exceeding the pack in some cases. Stonington Vineyards has upped its game substantially all the way around. Seaport White has long been a staple of summer tables in Connecticut and throughout New England for decades. This wine has won numerous awards and continue to be the winery's absolute crowd pleaser. A slightly, off-dry white bend of Cayuga and Chardonnay this stainless steel white is bright, fun, and zesty A great food wine but also perfect for summer sipping. A fantastic, easy drinking wine. Even with many more distinguished wines in the lineup Seaport White continues to impress! Stonington Vineyard Sheer Chardonnay 2013 is a "barrel-free" stainless steel chardonnay. It is a fabulous, easy drinking white, with green apple to spare, as well as other tropical notes, and a lovely, citrus ending. An outstanding minerally white meant to impress. Fresh, crisp, vibrant. Stonington Vineyard Chardonnay 2013 is a classic, French-oak barrel fermented chardonnay that is meant to impress. Beautiful notes of green and red apples, and Bosc pear, blend with hints of tangerine and apricot, and highlighted by other tropical fruits. A lovely mouthfeel followed with a hint of zest and a lovely vanilla toast. A nice, light, layered, complex chardonnay. A lovely Gewurztraminer, that explodes with notes of tropical fruit and candy, but with all the acidity of a classic Gewurztraminer. A beautiful, lovely light white wine with a big nose and lovely citrus ending. Very lovely! This lovely dry Riesling is a very, very good light white wine with lots of green, green apple, pineapple and a trove of other tropical fruits and lychee. A nice, tingling surprise, and meant to go with food, from cheese to other spicier fare like Asian or Indian cuisines. Excellent. Capitalizing on their summer reputation and borrowing slightly from the neighbors to the south of Long Island, Stonignton has taken on the mantle of the rose' maker of Connecticut. Much like several South Fork and North Fork cousins, they make more than one rose' to keep up with the demand. The first in Pink Noir 2014. This is a salmon pink off-dry blend of Pinot Noir Blanc and Riesling. Classic notes of strawberry and lime and cream explode out of the glass. There is a hint of sweetness, but the riesling keeps the wine honest with a zesty, bright, and clean finish that keeps it from being a lollipop and instead delivers a wonderful, wonderful wine! The Stonington Vienyards Triad Rose' 2014 was a reveleation! A lovely blend of Cabernet Franc, Vidal Blanc, and Chardonnay makes for a slightly pinker salmon-colored dry wine. Again, berries pop off the nose with a big dose of lime and green apple. Here, the stainless steel chardonnay gives the wine an honest, sophisticated backbone. A very lovely, refreshing but classy wine. Stonington Vineyard Cabernet Franc 2012 was a big glass of ripe berries - cherry, raspberry, red cassis - with hint of earth, leather, and graphite, and tinged with vanilla. A lovely. dry red, with tremendous potential. This i the hardest wine among them to obtain! Sells out fast! A wonderful red wine! Stonington Vineyards is a lovely, lovely visit! And the wines are imminently drinakble. My absolute favorites were the Sheer Chardonay and the Gewurztraminer, along with the Cab Franc. But I can't lie. I clearly visited in winter. If it were summer I would have brought home the two roses and the Seaport White. 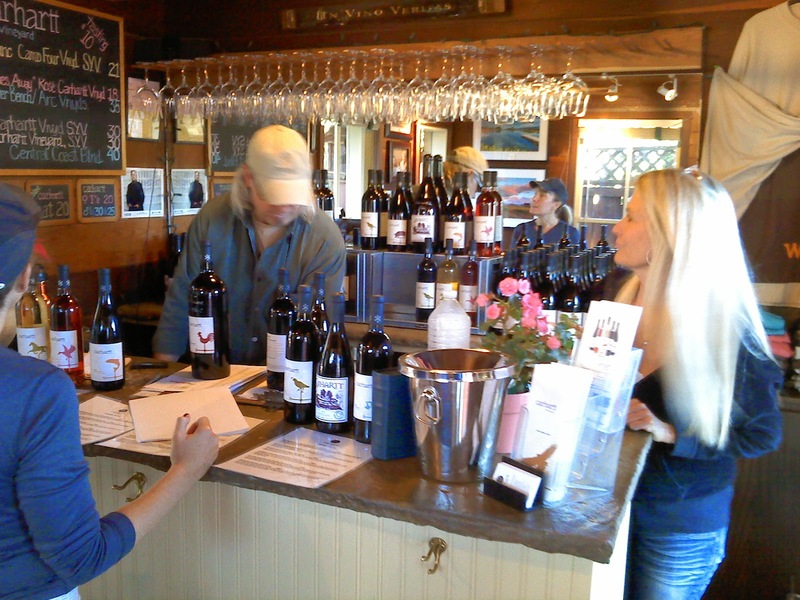 A great stop on your way through Connecticut wine country!